Vermont City Marathon this weekend! Speaking of marathons, rumor has it that Graham Sheriff ran the Shires of Vermont Marathon (in the rain) this past weekend (3:28:25) and snagged 4th place on the notoriously hilly course. 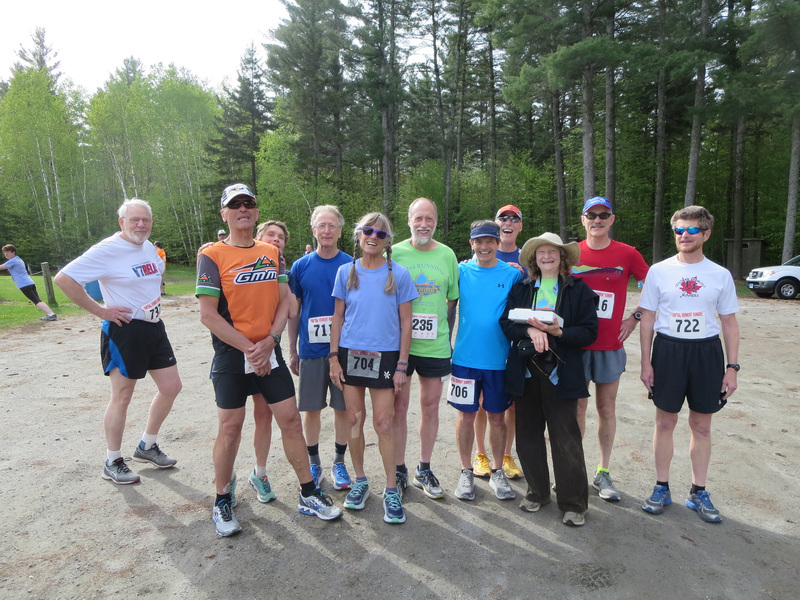 The 10th Barre Town Spring Run was held this past Saturday. As usual, the kids ruled the day with 61 of the 114 participants being 19 or under. 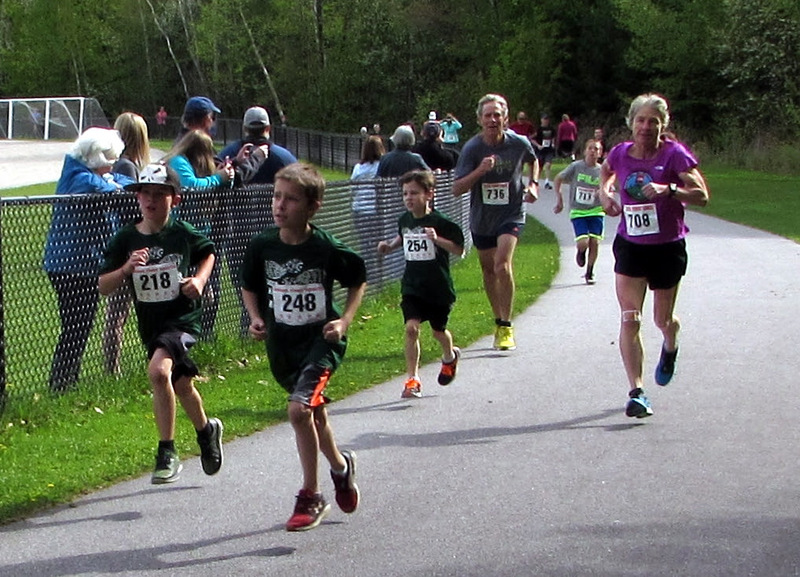 The race is a end of year celebration for the Barre Town Elementary Boys and Girls Running programs. And youth was triumphant: race winner Evan Thornton-Sherman was the overall male winner at 14 years old and 18:00 flat. The overall female winner was CVR member Dot Martin who is older than 14 but did get 100 race series points by running 22:24. The race had fine running weather this year and once again had a number of organic chickens as prizes provided by race director Andrea McLaughlin. This was the fourth race in the CVR/ORO Race Series. Next up: Capital City Stampede. CVR SUMMER OUTING-SAVE THE DATE! Sunday, July 15. We have reserved the picnic shelter at Boulder Beach in Groton. In the afternoon there will be activities such as swimming, hiking and possible preview of the upcoming Groton Forest Trail Race course. Plan for a cookout later in the afternoon, pot luck style. Further details to follow. CVR memberships renew on April 1. You may have expired on March 31 without realizing it. If you don’t know your status, please email Allie Nerenberg. If you are participating in the CVR/ORO Race Series, your membership must be active as of June 1 for any previous races to count. This 22nd annual Kids Track Meet is Friday, June 1 at 6pm at Montpelier High School. It is free to all school-age kids through 6th grade. The first 250 to register get t-shirts and everyone gets medals. Registration is at 5:30 and there are six events. Consider volunteering for or watching this fun event. Also this year there will be a food truck and an appearance by Miss Vermont Junior High School. Here is another way to participate: Dot Helling would like to give away running shirts that you don’t want to the kids and parents. The shirts should be clean, gently used and desirable enough to be worn by the kids and parents (I have some running shirts that are too ugly to even give away). You can bring the shirts to Dot at the Fun Runs or bring them to the track meet. Any questions about shirts or the event, or if you want to volunteer, please contact Dot. After the Kids Track Meet, the next CVR race will be the Capital City Stampede on June 9. Volunteers are welcome, please contact Shannon Salembier. Amy Sparks of 3stagecoaching.com is offering a Beginning Triathlon Class in Central Vermont starting June 2. She plans to include the Elmore Series as part of the learning experience. The training culminates with the August 12 Vermont Sun Race (Olympic or Sprint). I’ve decided to spend my birthday (my actual birthday!!!) running the Vermont City Marathon for charity. I have a sponsor page HERE where you can be a part of this awesome cause. I’ve been a volunteer coach for Girls on the Run for the last 4 years and just love it. The program not only helps elementary and middle school girls reach their goal of running/walking a 5K, but it also supports girls with critical social skills and builds self esteem during some tough developmental years. The program cost about 200$ per girl, but last year that cost was reduced in half because of people like you. Please consider a donation. –>May 27, Vermont City Marathon & Relays, Burlington. **June 9, Capital City Stampede, 5th in the CVR Race Series, Downtown Montpelier, 9AM.